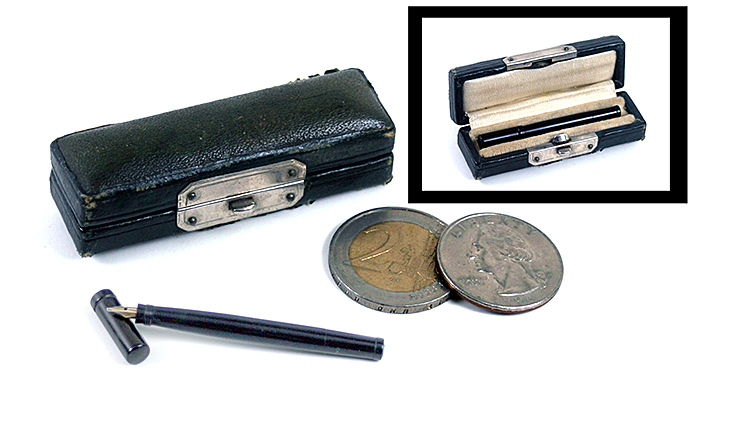 This 1910 Waterman is ”World’s Smallest Safety Pen”. It is currently available in Catalog #76. Eyedropper-filler in Black Hard Rubber. Spiral propelling/repelling unit in perfect operating condition. Often called the “Doll Pen” because one rests in Queen Mary’s doll house – in the Cone Cap rather than this Safety model, on the King’s Library Table. Produced by Waterman for their salesmen, with the intent for their salesmen to spend time with potential new accounts: buyers would indicate they didn’t need a new pen line and were content with what they had, but the salesman would have the World’s Smallest Pen to show them, since he was already there. This lead to more time spent with the buyer, more interaction, and this often resulted in a sale. Waterman published their in-house newspaper, Pen Prophet, that they would produce these for sale by their vendors as a special order item only. This model is new-old-stock, in near mint+ condition. Extremely rare, especially in the original coffin box! I would lime to know how .uch one of these pens are worth. I have one of these pens. It belonged to my late husband. I will sell if I am offered the right price.